From late May to the end of October, it is rainy season here in the Koh Chang Islands, but that does not mean the islands are lashed by torrential downpours all day and all night, nobody or nothing emerges from its bunker and life as we know it stops completely. It can be and indeed is very pleasant, with the sun shining as normal, rain storms overnight when we least care and everybody going about their business as normal. For sure, there will be bad weeks, when it clouds over, the grey blanket never seems to lift and the rain rolls in off the sea and down from the mountains, but it is never cold and the sun will return. Some kind of typhoon in the distant South China Seas is usually blamed, by the way, but even that cannot blow forever. Visitors to the islands are, of course, much reduced, and they knowingly or in many cases apparently unknowingly, throw themselves into this unpredictable weather, with an undinting holiday spirit and the added reward of slashed room prices, as compensation for the odd bad days. 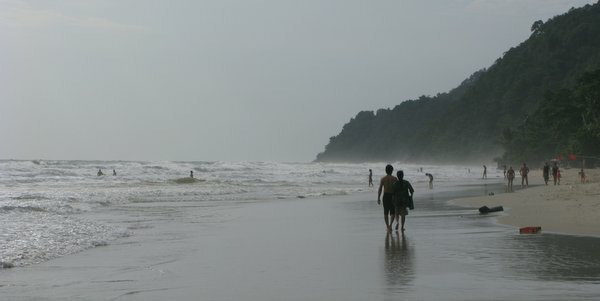 The sea does have a different feel, white-cappy and turbulent at the best of times, and this means beach life can seem a bit more Atlantic than Gulf Of Thailand, but it still beats sitting in an office or being at school. The inter-island transport out of Koh Chang stays in harbour, but the dive boats do brave things for those who cannot resist the lure of the deep and the snorkelers might see the odd fish. Contrary to popular myth, Koh Mak and Koh Kood are not cut off for months on end, with speedboats and express boats from the mainland still operating, but it only fair to say, that they do have an air of low season about them, more so than Koh Chang and many resorts shut up for the season. The perks of coming this time of the year are the waterfalls, which are, as you would expect, in full and resplendent flow and well worth paying a visit. On Koh Chang, the main falls are at Klong Plu on the west side but there are several others in Klong Son, Kai Bae Beach and down on the east coast at Dan Mai, Than Mayom and Salak Phet. Koh Kood, should you decide to head that way, can also boast three of its own, including Huang Nam Keaw, recently made accessible with a fine new track. The other main draw of the Islands during the rainy season is its wonderful colour. The jungle and interior, the mountains, even besides the roads, have a deep, natural green quality, a unique lushness of this part of the world at this time of year, that you will not experience elsewhere. As the sages like to put it, ‘you can hear it grow, you can, you can hear it grow’ and many of the businesses have noticed it too, renaming the rainy season to the more positive sounding green season, in order to attract guests. It may be marketing and a little Canute-like, but you cannot doubt its veracity.